I have spent hours today playing a strategy game on my PC. Hours. It wasn't Civ V. It wasn't Rome II. It wasn't even Company of Heroes 2. It was a tiny little game called Kingdoms. You don't do much in Kingdoms. 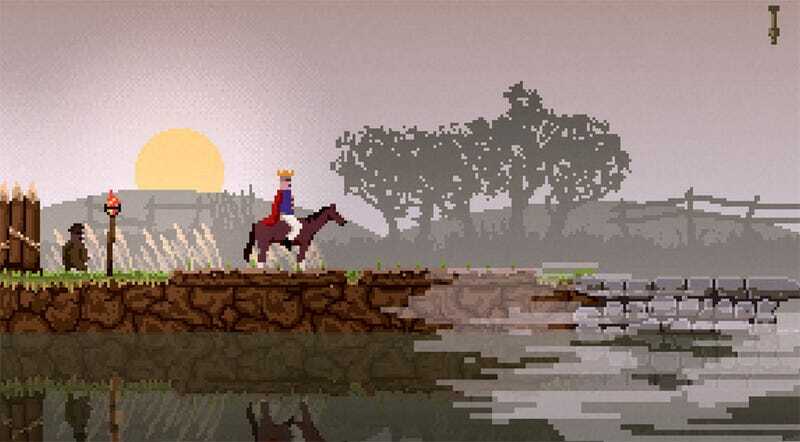 You play as a King, and you ride around a 2D kingdom on your horse. Every now and again you press "down", whether to recruit a new follower or upgrade a plot of land. But the game built around all that is just wonderful. By day, you recruit subjects, arm them, set them to work and upgrade your fortifications. By night, you endure ever-worsening attacks by zombies, where your villagers are killed, your stuff is trashed and your money stolen. When the morning comes, you rebuild and start all over. You can play it in your browser below.